Activity days were hosted with Year 5 pupils at Arbury, Cottenham, Queen Emma and Fulbourn Primary Schools, and St. Mary’s Junior School. The IfM team, led by PhD student Susannah Evans, designed engaging activities to introduce manufacturing concepts to children, and worked with teachers to tie these in with the curriculum of each school. The University’s Faculty of Education provided valuable advice and guidance to ensure that the activities aligned with the needs of schools. 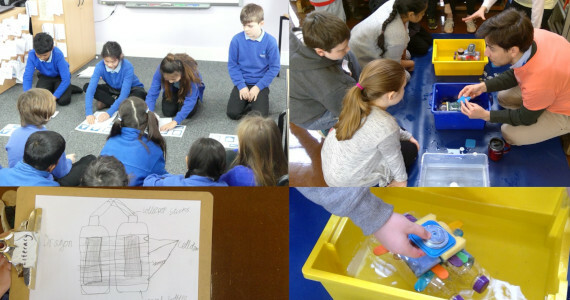 Pupils enthusiastically tackled a variety of challenges, including designing and making boats and paper aeroplanes, learning about buoyancy and aerodynamics. They also made devices to carry ping pong balls down a zip wire in the quickest possible time. Children worked in teams, with points awarded for cooperative working as well as how well they approached the tasks. Emphasis was put on the iterative nature of design and prototyping as well as the advantages of organising production in an assembly line. Afterwards, pupils were asked for their views about the day, and gave very positive responses: 95 percent said they enjoyed it, 90 percent said they had learned something new about engineering, and 74 percent wanted to find out more about engineering. The outreach programme was awarded funding by the Royal Academy of Engineering’s Ingenious grant scheme, with additional funding provided by the Sharman family and Churchill College.